This recipe is part of a series of posts especially for college students and first-time cooks, made using only items from the College Pantry and equipment from the College Kitchen. There are few more complete and satisfying meals-in-a-bowl than good-old chili. I think chili is a lot more wholesome than people give it credit for too. Yes, it’s spicy, it’s hearty “man” food, and it goes really well with chips or on top of hot dogs. But when you consider chili’s basic parts: tomatoes, onions, beans, spices, and ground meat (well-drained of fat) I don’t really think it’s very naughty. Plus, chili is cheap to put together and it freezes really well, which makes it a good meal for college kids to master. I’m not a college student anymore, but if I were making chili for my family I wouldn’t do anything differently. Ok, depending on the company I might add a bell pepper for extra vegetation. But that’s it. For your first time making this, I recommend pre-chopping your onions and garlic and getting your spices pre-measured and set aside in a bowl, cans opened and at the ready. The more you do to prepare, the less stressful the cooking process will be. 1. In your largest pot, heat a few teaspoons of neutral oil over medium heat. Saute diced onions until they are translucent. Go look at my knife skills tutorial if you need a good onion-dicing method. 2. When the onions are translucent, push them to the sides of the pot and plop the ground beef or turkey in the middle of the ring of onions you’ve created. The center of the pot will be the hottest, and you want to allow the meat to get a little bit browned. Break up the meat with a wooden spoon or spatula until it’s as chunky as you like it. 3. When the meat is all brown and cooked through, you can mix the onions in and drain off the fat by tipping the pot slightly to one side and using a spoon to scoop out the fat. Try to get most of it out, but if you can’t get the last little bit, don’t worry about it. 4. When your meat is drained, add your minced garlic, chili powder, and cumin and stir them into the meat and onions. 5. Add your beans and tomatoes and bring the pot to a bubble (still over medium heat). Once you see it bubbling, turn the heat to low and let it simmer for at least 20 minutes (up to an hour, as long as you check on it and stir it now and then to keep the chili from burning to the bottom of the pot) while you go study or text your friends to come over and help you eat chili. 6. Taste the chili. It will probably be under-seasoned. Add honey and salt and taste it again. Better, right? 7. 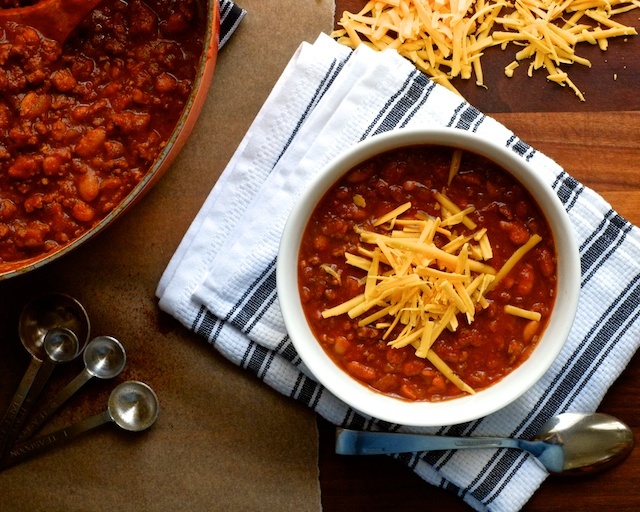 Serve your chili with grated cheese (which you probably already have!) and if you’ve planned ahead a bit, maybe some tortilla chips and sour cream or sliced avocado? This recipe makes about 5-6 servings of chili, so if that’s more than you and your friends can put away in one night, portion out the leftovers in plastic storage containers and keep it in the fridge (for 2-3 days) or put it in ziploc bags, date it, and store it in the freezer for up to a month. If you store it in the fridge, you can re-heat it in the microwave. If you freeze it, re-heat it slowly in a medium-sized pot over low heat.